Avoid top dress mess. Top dressing N might get the crop seeded faster, but check timing and technique. Good weed management and top dress fertilizer don’t always mix. Quack attack. 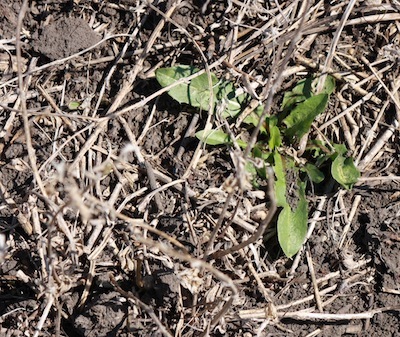 Quack grass and dandelions are two early weeds that can have a big impact on yield potential. Contain them. Crop insurance cut off. Canola seeded in early June still has reasonable yield potential, and crop insurance deadlines for Manitoba and Eastern Saskatchewan comply. A sweet relationship. 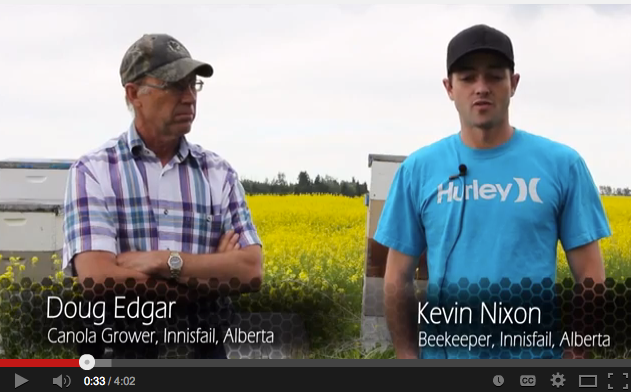 The Canola Council of Canada has four new videos to show the positive relationships between canola growers and beekeepers and between canola and bees. 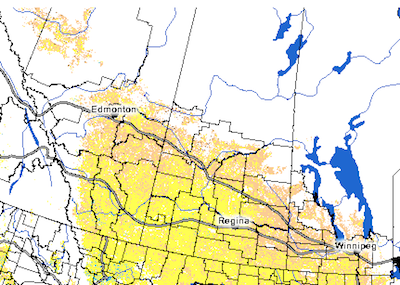 This map shows the difference in Normalized Difference Vegetation Index (NDVI) at 1-kilometer resolution as of May 19 to 25, 2014 compared to the same period in 2013. 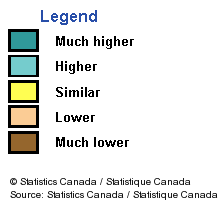 Yellow areas are similar to last year, light brown areas are slightly behind. 1. Flea beetles have been feeding on these cotyledons. What percentage of these leaves are considered defoliated? 2. Cutworm damage tends to be in patches. But lots of damage can occur in patches, including herbicide carryover, seedling diseases, so scouting is essential. What is the best way to scout for cutworms? 3. Why is this insect special? 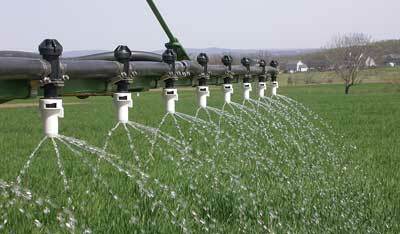 In an Alberta study, fertigation was put on at three different stages — 5-leaf, bolting, and flowering — and then compared to plots where all nitrogen was applied at the time of seeding. The study has only one year of results, and so far they show that with canola, fertigation is — at best — equal to the treatment that received all nitrogen at the time of seeding. If a burnoff didn’t get done or missed key yield robbing early season weeds such as quackgrass and dandelion, then control has to be early in crop to prevent significant yield loss. For quackgrass in particular, in crop control may require a tank mix with good activity on grasses.